Bring charm to your living room with this Large Skirted Ottoman. This footstool has an oversized cushion and a kick pleat skirt. Welt cord trim detailing adds traditional style. This ottoman would be a great footstool for the upholstered chair or sofa with pleated skirt in a family room or den. The Tulsa Large Skirted Ottoman by Kincaid Furniture at Thornton Furniture in the Bowling Green, Alvaton, Glasgow, Scottsville, Franklin area. Product availability may vary. Contact us for the most current availability on this product. The Tulsa Collection is a casual group of seating options that you can completely customize to fit the decor of your home. 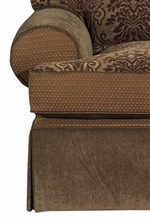 With over 600 exciting upholstery options, there is sure to be a look or two that matches your style. The Tulsa Collection features simple, low profile rolled arms, kick pleat skirts and plush accent pillows. The collection includes a sofa, loveseat (not shown), chair (not shown), chair and a half, large ottoman (no longer available), regular ottoman (not shown) and sleeper (not shown). The Tulsa collection is a great option if you are looking for Casual furniture in the Bowling Green, Alvaton, Glasgow, Scottsville, Franklin area. Browse other items in the Tulsa collection from Thornton Furniture in the Bowling Green, Alvaton, Glasgow, Scottsville, Franklin area.